It is not what the news headlines this morning in Scotland are describing. Here’s what the numbers say. The SNP increased its number of councillors. The Tories increased their number of councillors. Labour lost almost half its councillors. The gap between the party with most councillors and the second place party got much bigger. What to make of the headlines then? Far from having reached “Peak-Nat” it looks more like we’ve reached “Peak-Tory”. Even with all the hype and support in the media, the Tories success looks like it has been built on the continuing collapse of the Labour vote. Unionist supporters have transferred their allegiance to the only other unionist party. That has to be a cause for concern inside Labour ranks. But should it be a reason for cause for concern in SNP and Indy supporting ranks? Less so. 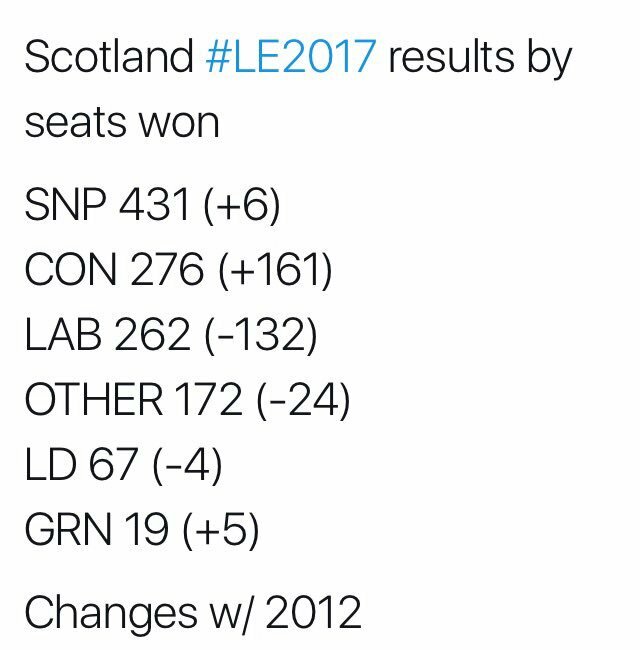 The SNP vote more than held up. It increased. Certainly the Tory vote increased too – but it is easier to create a massive gain when you start from a low position. Doubling from 12% to 24% is good, but where’s the next growth going to come from? Consider also the fantastic growth for the Green Party. They’ve gone from 8 councillors to 19. Statistically that’s an even better growth and result than the Tories. If the results are considered in terms of unionist and indy then it most certainly isn’t the newspaper headlines that are being accurate. Accuracy is that the Indy support has increased. And that the Tories have nowhere left to gain ‘soft’ votes. “Peak-Tory” looks like a realistic and rational analysis. But you won’t hear that on the TV or radio and certainly won’t read it in a mainstream newspaper. Scotland is still walking towards an independent future. Despite the hype and claims in the media.